Linden Lab’s Sansar, a new VR-enabled online community provides content creators with powerful tools to unleash immersive, dreamlike digital worlds. Create and enjoy your very own Sansar VR world on 8th Gen Intel® Core™ processor-based PCs, add HTC Vive headsets equipped with Intel’s Wigig technology, and the end result is a Fourth Dimension wireless experience that defies human imagination. 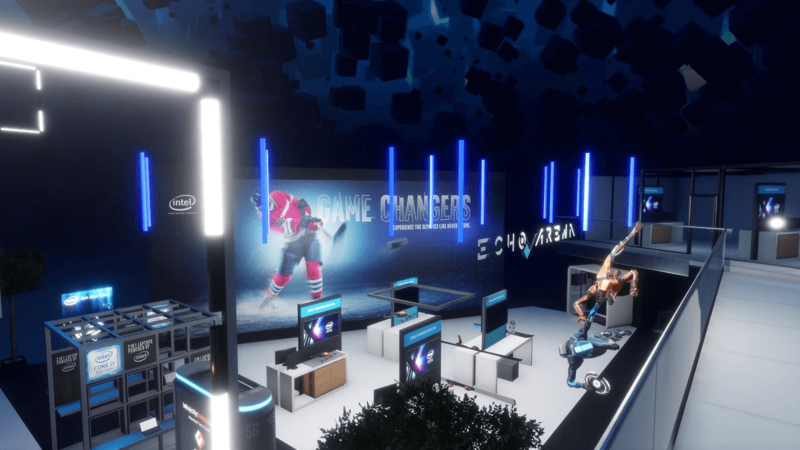 Together Intel and Sansar are delivering compute experiences where you and others from around the world may explore the inside of an 8th Gen Intel Core processor, transport to a set location from the upcoming movie Ready Player One and witness many of the same Intel demos being shared live in Las Vegas. Join the VR experience at CES now! The idea of VR extends all the way back to Plato’s Allegory of the Cave which challenged the very nature of perception. Indeed, the VR experiences at CES demonstrate how the lines between Art and Literature and Science and Technology are blurring to create stunning immersive experiences. I predict these types of VR experiences will within the next decade become natural extensions of how we come to know and experience our human existence. VR worlds ignite our imagination and inspire our creativity. Our ingenuity for building cloud to client compute VR experiences signals a renaissance of exploration and discovery. Consider these VR-enabled possibilities. The patient and physician will traverse the steps of a pending brain tumor operation. The age-worn grandmother will climb the Giza Pyramids alongside her grandchildren without ever leaving home. School children from different cultures will convene at the Louvre to appreciate and discuss the Mona Lisa. Philanthropists, business people, world leaders, educators and storytellers around the world will one day very soon use VR to connect us to real-world problems to solve. We will see and experience so much more and expand our human awareness and empathy with every new VR application.